“It is better to give than to receive.”…but even better are thank you’s. The North Star Elementary Children’s Choir is paying us a visit tomorrow (Wednesday, Dec. 15) at 1:30 PM to sing for us. This is a big thank you to Junior Towne and our wonderful customers who have donated shoes and clothing to children in need throughout the years. North Star is one of the oldest elementary schools in Anchorage (I graduated from it!) and several homeless shelters feed into it. All contributions are very much and gratefully appreciated. We will have special candy cane sleighs for the choir and everyone who joins us tomorrow. The program will last about 30 minutes and should be lots of fun. See you then! We had a wonderful Thanksgiving with friends and, of course, lots of food. Among the twenty guests around the table were a family of five who had just moved up from Oregon. They commented how our traditions are the same as the Thanksgiving they were familiar with, with just a few twists. Here in Alaska we forget how different we can be. 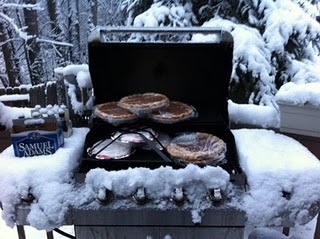 Thanksgiving moose in the yard, several inches of snow on the ground (several of our guests skied to our house) and of course the freezer annex on the back porch which doubles as a barbeque grill in the summer time. On to Christmas! As we count our many blessings this Thanksgiving, we give thanks for you, our loyal customers, for another great year outfitting little Alaskans. We have collected so many wonderful stories and memories throughout the years. Please remember that we will be closing at 5 PM on Wednesday, November 24th and will reopen Friday morning at 10 AM. Have a blessed and joyous Thanksgiving with friends and family. But the secret is out. Junior Towne has the best selection of Christmas dresses,ever. We are putting them out today just in time to appear at the Nutcracker dressed in your holiday finery! Boys suits and outfits are in, too! Come check it out. 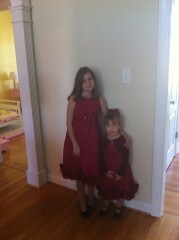 Shown here are Sarah and Emily in dresses purchased for them by their Grandmother. They are well blessed girls! It’s Our 54th Anniversary Sale! PS-the sale includes shoes and school dress code selections. *Sale limited to stock on floor, may not be combined with other offers or discounts. Haba traditional wooden toys made in Germany. Certain Britax Chaperone infant carseats manufactured between April 2009 and May 2010 have been recalled. The chest clips on the carseats can become brittle and snap. If the chest clip breaks, the broken chest clip should be removed, however, the carseat can continue to be used until the replacement chest clip has been installed. For further instructions, visit www.ChaperoneSeatRecall.com. Britax is a a very good company and this is the first recall that we can remember for a very long time. You are currently browsing the Junior Towne Blog weblog archives.